Executive Vice President Johan Pauwels (left) at Materialise and President Mooyoung Jung (right) of UNIST are shaking hands at the signing ceremony for cooperation MoU. The signing ceremony of MOU between UNIST and Materialise took place Moday, May 15, 2017. 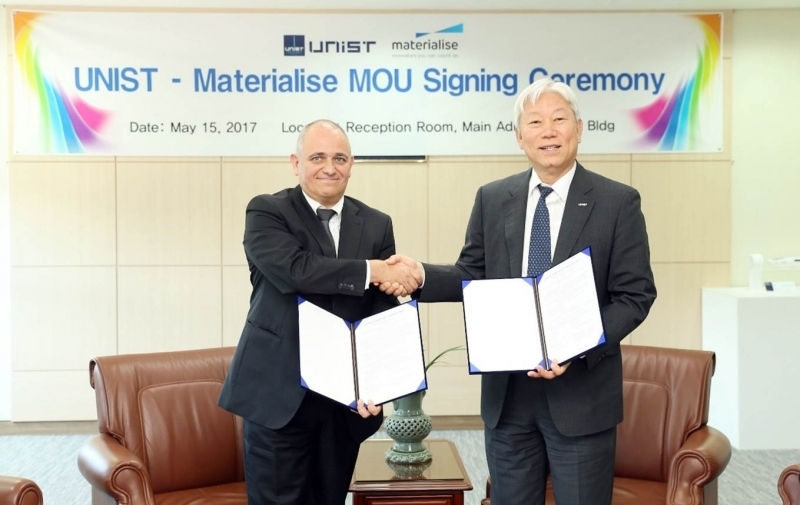 On May 15, UNIST signed a Memorandum of Understanding (MoU) with Materialise Inc., a Belgium-based company that specialises in 3D printing software and services to pledge mutual support for one another in the pursuit of excellence in 3D printing R&D. In the memorandum of understanding, the two organizations promised to collaborate on the development of a range of lightweight composite parts for transportation equipment, such as automobiles, aircrafts, and ships using UNIST’s 3D printing technology. “3D printing technologies have the potential to change the traditional manufacturing paradigm,” says President Mooyoung Jung of UNIST. “Therefore, achieving its technological innovations is a fatal task not only for Ulsan but also for the nation”. 3D printing technology is attracting much attention, as a key technology to bring innovation to the manufacturing industry in Ulsan. With the official launch of UNIST’s 3D Advanced Additive Manufacturing Center, 3D printing will become the city of Ulsan’s new future growth engine, following the bioindustry. In recent years, the center has undertaken an important R&BD project to produce eco-friendly 3D printed automotive parts, as well as patient-specific 3D printed implants. The potential of 3D printing is almost infinite. With a 3D printer, one can manufacture automotive parts at the touch of a button without going through complex assembly procedures. Ulsan is South Korea’s only regulation-free zone for 3D printing. The city plans to foster the 3D printing industry as the 5th core business for future growth and development, which includes the establishment of a national 3D printing research center.